I am writing this column on a train, as I often do. I also write emails, letters, speeches – even company reports and presentations when I can secure one of those individual airline-style seats that afford some protection to client confidentiality. In short, I find rail travel hugely productive and always have done. There are usually fewer distractions than in the office. This is particularly true for those like me who supposedly work at home, where the temptation to make a pot of tea, potter around dusting the bookshelves or take the dog for a walk so often proves irresistible. If I do say so myself, over the years I have done some of my very best writing on trains. Helped no doubt by the 5.30am start required to get me on the first departure from Alnmouth to King’s Cross. Because like many people I am at my best for work purposes, if not for small talk, early in the morning. But even late journeys home are rarely a waste of time, enabling me to catch up on much accumulated reading. Before the accountants abolished that civilised institution, I also made more useful and interesting contacts in the restaurant cars of the East Coast main line than almost anywhere else. An image "The GNER restaurant car, RIP" has been removed to avoid potential charges (financial, not criminal) from the money-grubbing image copyright police. I wish I had taken my own photograph while I had the chance. Partly, no doubt, because it was one of the few places where one would routinely share a table with total strangers. Hence I am a great – some who have ventured into my attic might say obsessive – fan of trains and rail travel. Yet according to a study commissioned by the Department of Transport last week, I am in a tiny (well, ten per cent) minority in actually finding train journeys useful. The other 90 per cent of business travellers apparently waste their time watching other people, staring out of the window, reading trash or surfing the internet. This seems completely at odds with my own experience and observations. Is he bored? Or is that a light bulb above his head? But what a helpful coincidence that these timely survey findings should back up the Department’s claim that there is a sound business case for splurging £17 billion of our money to shave a massive 23 wasted minutes off the fastest journey time from London to Birmingham New Street through the construction of the HS2 high speed rail link. A project which will, at the same time, lead to a marked deterioration in service for those travelling from the current intermediate stations on the West Coast line. The problem for the Transport Department is that anyone with half a brain can see that high speed rail between London and Birmingham makes no sense at all. This is not to deny that they could make a case for it between London and Glasgow, though only if one believes that faster transport links boost regional economies rather than sucking life out of them to the centre, as all the evidence of the 186 years since the opening of the Stockton & Darlington Railway suggests to me. But for PR purposes they surely need to start building the thing in Sauchiehall Street, so that by the time it reaches the West Midlands adding an extension to Euston could be presented as a no-brainer. The last traditional main line constructed in Britain, the Great Central Railway’s London extension to Marylebone, was developed that way around. Purpose-built to the Continental loading gauge for connection to a Channel tunnel, it was ripped up in the 1960s by a typically forward-thinking Government that assumed trains had had their day. 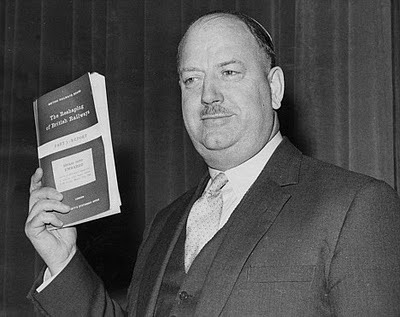 How useful some of the main lines, diversionary routes and passing loops destroyed by Dr Beeching would be today. Would it not prove more cost-effective to increase capacity by reinstating those rather than embarking on the HS2 project? Unless, of course, you believe that all time spent travelling is wasted. But if that is the case, why aren’t we all flying on the rocket-powered successor to Concorde? And are the Department’s researchers really on the right lines when they loftily dismiss the time business travellers spend staring out of the train window as “daydreaming”? Perhaps they are actually indulging in that most important activity for any of us: thinking. It might be helpful if our politicians and civil servants tried it more often.